Father’s Day is right around the corner and I started to look for ways to put together incredible gift baskets but for less. While in my local Dollar Store, I came across an entire section of BBQ essentials. I couldn’t believe how extensive their selection was. YEOW! It got me thinking – what a great BBQ gift basket I could make for a special man in my life… and probably for under $20. If you are someone who is still looking for Father’s Day gift ideas, I want you to take a look at what I was able to do for $16. 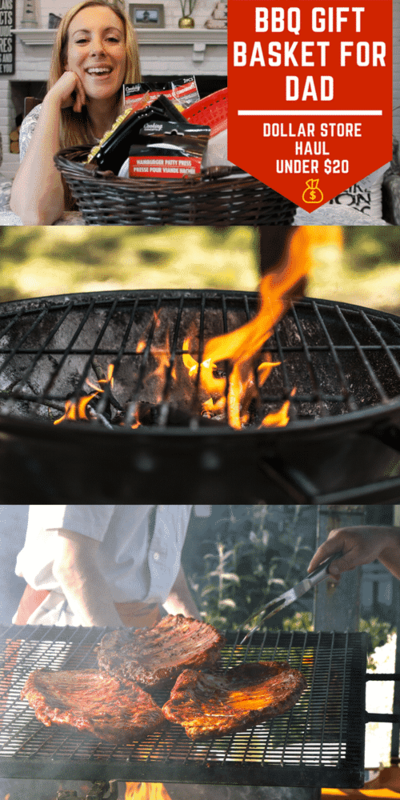 Perhaps your husband isn’t a griller… but I bet you know someone that is. Your father, father-in-law, brother, child’s teacher, pastor… even that neighbor who always gets your mail whenever you are away!! There are countless men that grill. I constantly smell that charcoal scent all summer long. Someone is doing it, right? For under $20, you can wow them this holiday with a wonderful gift basket that shows them you care and put thought into noticing one of their favorite downtime hobbies. Here’s the best thing about this Father’s Day gift basket haul from the Dollar Store – it’s completely customizable. You could probably choose $10 worth of goods and still make quite the showing. You don’t need everything I selected. Truly! Opt for what works best for you and call it a day. We really don’t need to spend a ton of money to have a big impact on someone’s life. I’m really over that notion. I don’t know, guys. Something just clicked with me this month. I don’t talk about it much, but I own some commercial property with my husband and we are actively trying to buy another building this week. It’s hard. It’s really going to stretch our budgets thin to make this new purchase. We are doing it for our future – for our children. We are planners. We know it’s important. We know that our money is better spent on REAL things like THAT. Not fluff $400 watches. I rather put $400 towards a mortgage payment – ammmiiirrrriigghhhtt? So, truly – I started to look at everything that I spend money on this month and last and I realized just how wasteful I’ve been my whole life. I can still live my best life – don’t get me wrong. But I want to spend my money wisely. I want to make better decisions so that when I want to take my entire family to Europe, I can. Or when I’m ready to buy another commercial property, I can. Or when we want to buy another 100 shares of WWE, we can. How do we start doing that? By being smart day to day. By making better decisions while in smaller moments. We can start here – for Father’s Day. $16 is a WIN. What do you think about this Father’s Day BBQ Gift Basket that I made from the Dollar Store? Have you watched the video? Would love to hear what you think! Be sure to subscribe to my YouTube channel for more content like this.